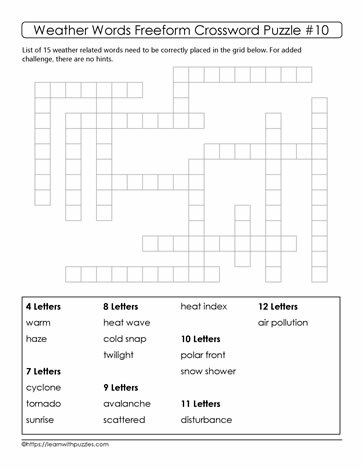 Here is a freeform crossword puzzle to help consolidate understanding and spelling of weather related vocabulary. To solve the puzzle, place each word, from the list of words, into the proper place in the grid. Start by locating the category of words that has the least number in that category. This puzzle is suitable for students learning about global warming, environmental science and weather related words. To help consolidate understanding of these words, educators can use this list to engage students to record definitions, illustrate the concept, write the words in sentences and other differentiated approaches to learning.